A quote from our interview with Schindler about vertical mobility was retweeted by Schindler Elevators. 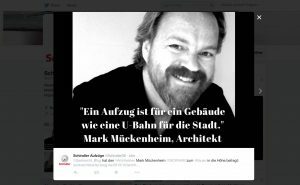 Mark Mueckenheim’s quote is in German and means: “An elevator is for a building what a subway is for a city” as they are making elevators we are not surprised that they liked that one. Posted in News and tagged with Mark Mückenheim Mark Mueckenheim MCKNHM Schindler .